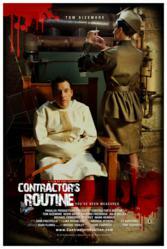 San Francisco movie-goers are looking forward to the June 3rd 2011 premiere of the thought provoking new film, Contractor's Routine, by director Yuri Tsapaev. Yuri Tsapayev's brilliant and disturbing new film Contractor's Routine delves into territory familiar to any thinking man or woman trying to make sense of the new media age. Shot in and around San Francisco, its high cinematic values match those of leading Hollywood production companies. And the talented cast includes international film star Tom Sizemore. The protagonist Jacob is quirky, curious, attractive and self-educated. He takes advice from his alter ego, like we do from social media friends or followers. His personality disorders are hidden behind his work, lifestyle and social interaction.
. . . and he uses conventional household appliances in some very unusual ways! The June 3rd 2011 opening of this unique film event at Lumiere Theater is attracting the attention of the Bay Area's leading thinkers and artists. You and every local social media aficionado should be there too. Mind wide open.